Oh Tina! What a wonderful idea! You inspire me. I love the cover and what I can see of the inside pages. You should write a post about each of your successes. I’d love to read it. I’m definitely filing this post away under “Inspiration”. Glad it inspired you, Tracy! I’m sure you have lots of things to file! Oh…I have a few things kicking around. I love this idea. I have my published pieces in a boring file folder. This is much better (more visual). I hope to see your notebook soon, Hannah! As a former journalist, I have a “clip file,” which is pretty much a file folder stuffed with newspaper articles. This looks like a much better way of presenting the material and using it as motivation. Thanks for the idea! You’re welcome. Have fun organizing, Kirsten! I LOVE this idea! It sure beats a pile of magazines with sticky note markers in them! How did I never think of this?! I did make a traditional scrapbook about my one (so far) published book. It starts with my acceptance email, and includes reviews, mentions, photographs from books signings and author visits, newspaper articles, and thank you notes from classes I visited. I need to start a new scrapbook immediately and get this stuff organized! 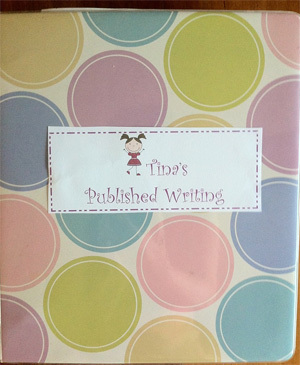 I like the idea of your first scrapbook regarding the journey for your 1st book. Happy scrapbooking this new one! Thanks, Susanna, for stopping by. I’m sure you’d have LOTS of things to include! This is a great idea! Now to fill one up! Thanks for visiting, Stacy! Yes, have fun making a notebook! Very inspiring post! 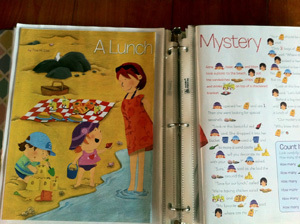 I have a binder of all my published magazine pieces that looks almost exactly like yours. Each piece is protected in an archival quality plastic sheath like yours. Not only is it a good pick-me-up for writer’s block blues, but my kids LOVE looking through it. It’s become part of our family heritage and sits near our family scrap books. I’ve also taken it to school visits and the students like looking through it as well. That’s neat, Laura, that you also have one. What a great idea to set it by the family scrapbooks. I should do that.